I’m happy to tell you that we arrived in Beijing safe and sound. We were a little tired from the long plane ride (to say the least) but we feel lucky to get here on a sunny day and extremely excited to explore the city! Our first day was relatively short since our flight arrived late. We are already are feeling the culture shock. We are definitely not in Kansas anymore. From the airport we headed to the silk market. Everyone put their bargaining skills to the test. We are talking about shopping of the fittest! We left this place exhausted after an hour of mind games with the skilled vendors the participants felt like there are still too many Yuans taking up space in their wallets. After an hour and a half of shopping, we headed to the hotel for dinner and to light the Hanukkah candles. We ate a wonderful Chinese dinner followed by candle lighting. It was entertaining to see the Chinese hotel guests staring at us wondering why this odd group of people is gathering around a few candles, singing these weird unfamiliar songs. By now, most of the group is pretty much exhausted and ready for sleep. We need to get some rest for our busy day tomorrow. It’s amazing that we’ve been in Beijing for only 2 days but have already absorbed so many of the treats China has to offer. This morning we woke up at 6:30 to start our journey in China. On our way to the Ming tombs we stopped at a hospital where we learned about healing creams and potions and had the chance to try them out on ourselves. From there we drove to the Ming Tombs, where we saw the temple that the Chinese built to honor of the Ming dynasty. The temple was overwhelming and beautiful, full of small details carved in wood. We then walked to a beautiful park that was built in honor of the emperor. The park was full of statues of different dudes and animals, only some of which actually existed, excluding the dragon. From there we drove to lunch at a local restaurant. It was very yummy, again providing a taste of the local cuisine #cantgetenoughrice. From there we drove to the GREAT WALL OF CHINA! 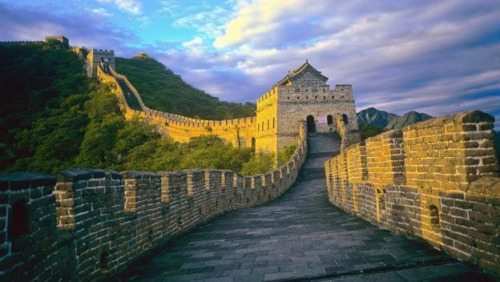 (One of the great wonders of the world, and 1 of 2 in China). If I could use one word to describe the wall it would be breathtaking. We still cant believe that humans could have built something so incredible, especially so long ago. While walking up the endless stairs, Mary, our tour guide, informed us of the history of the wall. 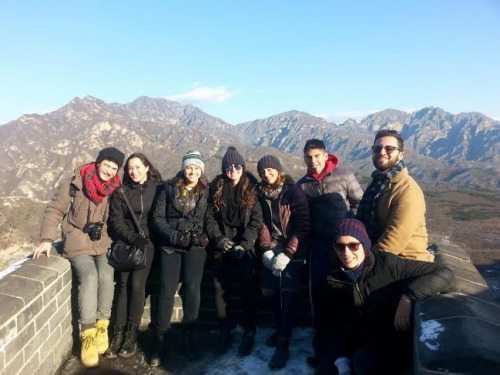 We learned that 7 emperors had built the wall and that the wall is sometimes jokingly referred to as the long tomb because workers in the old days, if they died of exhaustion, had their bodies thrown in for more building materials. The wall in total is also more than 20000 km long. Afterwards we drove back to the city to see the Olympic park, built in 2008 for the Olympics in Beijing that year. From there we went to a dinner at the Chabad house. 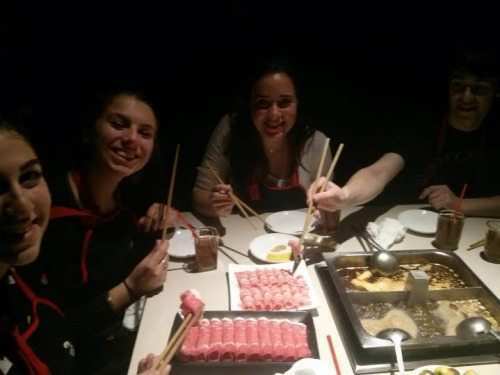 For all of the students who keep kosher it was the first opportunity to eat meat since arriving in China. I must say it has been really fun here but also extremely cold. 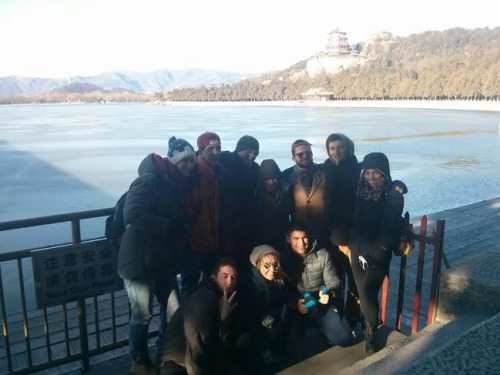 Yesterday we even had some snow in Beijing. We are beginning to understand how huge Beijing really is… Keep in mind, Beijing is home to 20 million people (that is more than three times the population of Israel) so you can imagine what traffic is like. 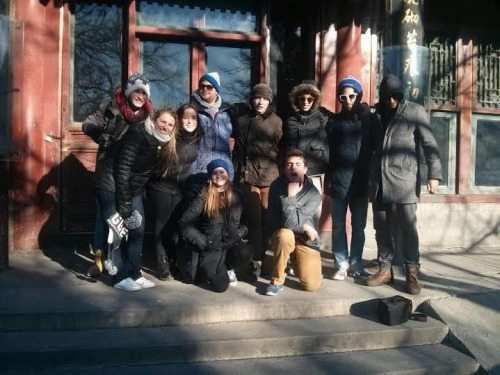 Nevertheless, we enjoyed seeing the city landscape out the windows as we journeyed across town to visit the Summer Palace. The Summer Palace is the beautiful royal gardens built for the Emperors’ families to spend their summer months during the Quing Dynasty. Empress Dowager Tzu-hsi, who is referred to as “the dragon lady” used to stay in this palace. The legend says that even though she’d eat 120 courses in a meal, she was a very beautiful woman and worked hard on her appearance. The grounds and the architecture are really amazing! One of the features the tour guide was very excited to share with us was the walk we took through the longest corridor in the world which stretches 820 yards. 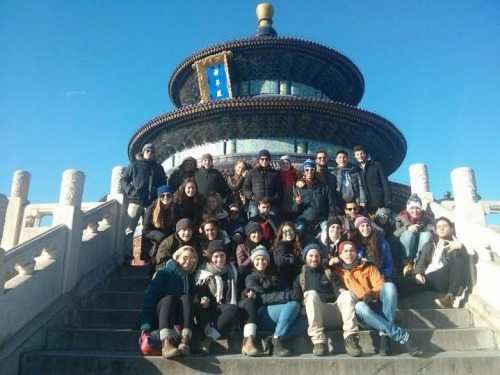 After that we went to the “Temple of Heaven.” This is a phenomenal, beautiful temple which served the royal family as a place where they could offer their sacrifices to ensure a good harvest. We were surprised to find out that the Temple of Heaven is three times the size of the Forbidden City (which we will visit soon!) It is HUGE! All throughout the day, and especially at this site, the students were armed with their cameras shooting a million pictures! Without facebook access here, there has been a lot of posting to Instagram! One of the highlights of the trip is experiencing Chinese culture. We’ve eaten some wonderful Chinese food (which of course is only referred to as “food” in China…) And, today after lunch we went to a tea house. There we meet a really nice Chinese woman who taught us all about the Chinese tea ceremony, different teas, how to properly hold our tea cups, the medicinal properties of tea, and much more. In the evening, we had another cool experience as we ate dinner at a “Hot Pot” restaurant. It was a really cool… Hot Pot is sort of like fondue but with hot water. In the middle of each table there is a pot of boiling hot water and each of us chose which foods to cook. After fishing our dinner out of the pot with chopsticks, we then dipped each bite in a variety of sauces of our choosing. It was really good and the students enjoyed it because it’s authentic, simple, and tasty! We finished out evening with a bang! We went to an acrobatics show which was truly spectacular entertainment! 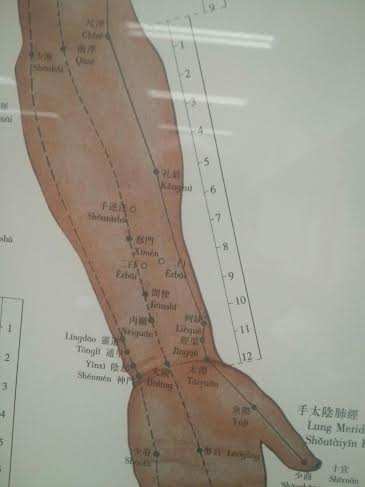 The Chinese are known for their flexibility and we were amazed at their talent. People flying in the air, through hoops and to unimaginable heights! We held our breath a couple of times during the show when we were sure a serious injury was about to occur on stage, but somehow it didn’t. It was an awesome performance and you’ll see in the pictures – it was simply amazing! Today was our fourth day here in Beijing. Everyday we have done and seen so much! 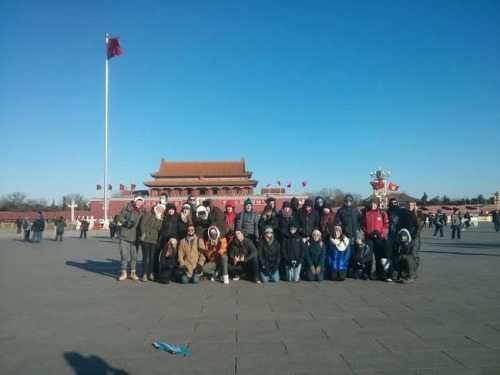 In the morning today, we started out by going to Tienanmen Square. It is MASSIVE! The square is large enough to fit more than 1 million people standing in it which makes it one of the biggest squares in the world. It was used to serve the emperor during the Ying Dynasty. As you all probably know (but most Chinese people do NOT know…), Tienanmen Square is best known in recent history as the focal point of the protests of in 1989 which ended with the declaration of martial law in Beijing by the government and the shooting of several hundred, or possibly thousands, of civilians by soldiers. The Chinese do not teach about these events and the entire story of the “Tank Man” is widely unknown to Chinese citizens. 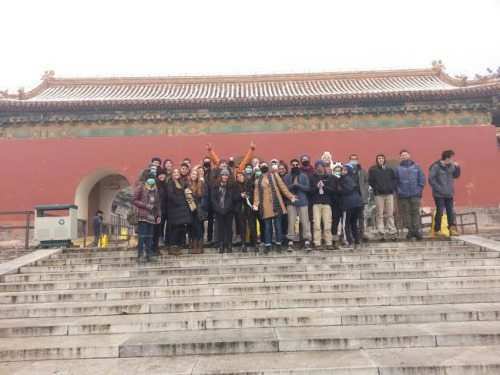 Even though it was extremely cold today, almost zero Celsius, everyone was eager to learn about the Forbidden City located just next to Tienanmen Square which was was the Chinese imperial palace from the Ming dynasty to the end of the Qing dynasty—the years 1420 to 1912. 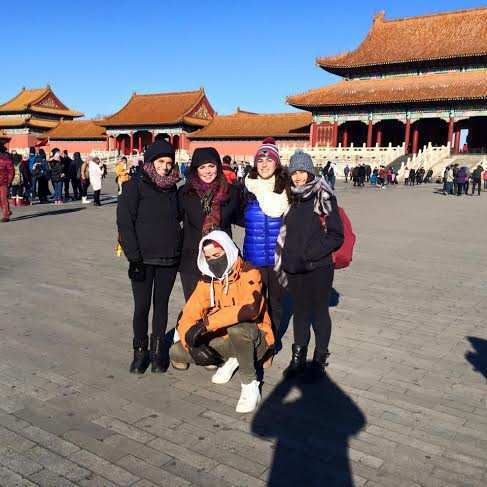 Inside the Forbidden City, we got to see how the emperor used to live and we also saw all the incredible Chinese architecture and its amazing attention to detail. 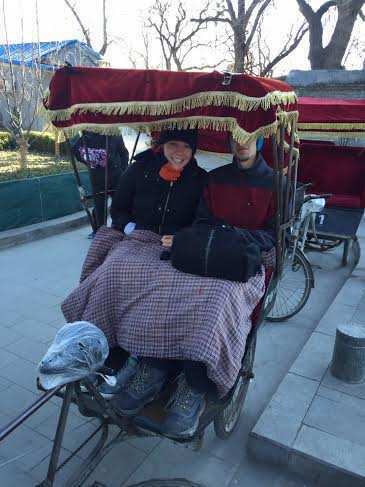 Our next activity allowed us to get all cuddled up and cozy under warm blankets as passengers in rickshaws. We were driven around by the local drivers and had a great time! Then we moved on to the Silk Factory where we got instructions on how to make silk quilts. “Made in China” is the motto around here so we of course used the rest of the afternoon to do some more shopping! The students are loving the bargain culture and bought many mementos. We capped the night off with an optional outing to a local billiards hall to play a bit of pool. We can’t wait to see what our last day holds! Thursday was one of the most meaningful and interesting days we’ve had in China so far. Our day started at 7:00 am with a message which said “Your flight back to Israel was canceled by El Al. You are staying in China until Sunday night…” As you can imagine, this news was met with a variety of reactions. 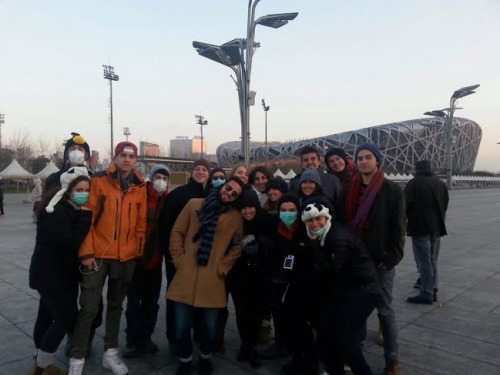 Most of the students were excited by the fact that we have another 3 full days in China, some were a little nervous and a few seemed not to know how to react for a couple hours until the news really set in. We were pleased that El Al was able to accommodate the four students who had commitments this weekend in Israel and requested to return before Shabbat. They arrived safely back in Israel Friday morning after flying back on a connecting flight on another airline. 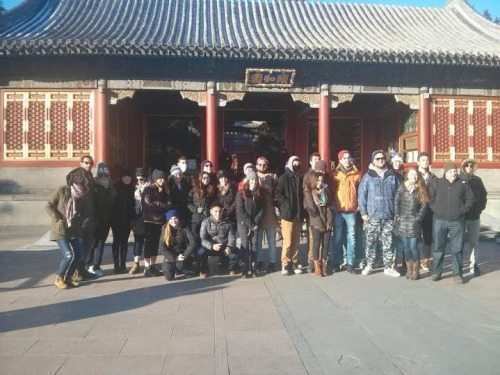 After a great breakfast in the hotel, we loaded the bus and headed to the Lama Temple. It is a beautiful ancient Buddhist temple, built at the end of the 1600’s, full of huge Buddha statues and monks. After couple of minutes of walking through the halls of the Temple area we were astonished by a magnificent Buddha statue 26 meters high! Visiting the Temple, we were surrounded by incense and a culture very new to all of us. Everyone enjoyed taking colorful pictures and taking in the atmosphere. Although we weren’t flying home to Israel Thursday night, we did visit Israel in a way as our next stop was the Israeli Embassy. Our meeting the Embassy officials was very interesting and informative. We learned about the relationship between Israel and China and life as a Jew in this communist country. Despite the fact that Israel is minuscule in size compared to China, Israel has a lot to offer and a lot to give to this huge country. 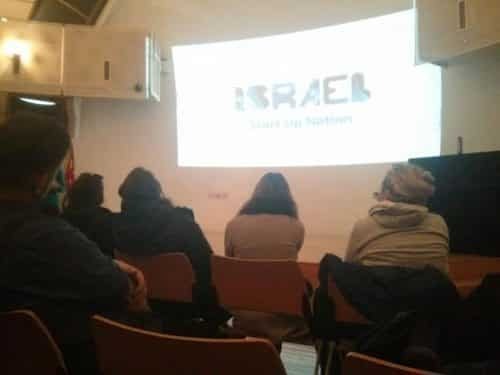 We learned about some of the projects that Israel is involved in such as in the areas of agriculture and the enormous challenge China has in feeding a nation with such an incredibly large population. 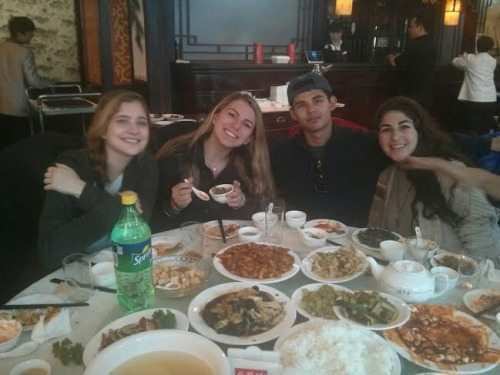 For lunch, we went to a “Peking Duck” restaurant, the dish Beijing is most known for, and surrounded by delicious food, the atmosphere among the group shifted. With full stomachs and Jonathan Cohen’s positive energy, it suddenly set in that our flight delay was a huge gift and this amazing trip was not soon coming to an end. 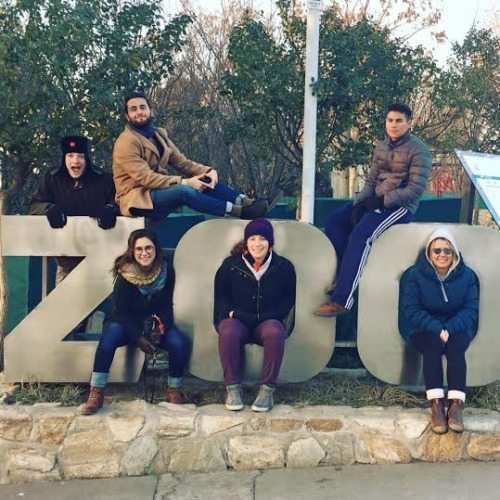 In the afternoon, we visited the Beijing Zoo. The zoo was not on our original itinerary but we added it in now that we had more time to sight-see over the next few days. What a great addition to the trip the zoo was! 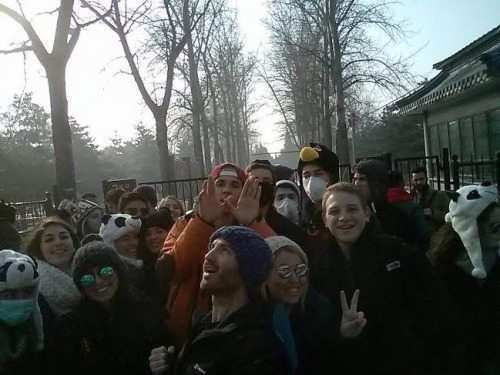 I wish you could have see the students’ faces when they saw the pandas! Kobi Hamilton was so excited by the pandas that he didn’t want to leave. One of the cool parts of visiting another country is experiencing the local cuisine. With a considerable number of Buddhists in China, there is no shortage of vegetarian restaurants in Beijing. So for dinner we ate at an amazing vegan restaurant which even the hearty meat eaters among us truly enjoyed! Throughout the day we also worked out a great itinerary for the weekend and coordinated with the local Chabad to join them for Shabbat. The synagogue is a short walk from our hotel and being here for the weekend will give us a unique look into Jewish life in Beijing. We will also walk to the nearby 798 Art Zone, have a Tai Chi workshop, and on Friday we will visit a Chinese Hospital to learn about acupuncture and other forms of Chinese Medicine. The variety of other sites and experiences awaiting for us will surely be a fun bonus for us as well. After another wonderful day, I can truly say on the behalf of myself and the students, thank you EL-AL for giving us a little bit more time in China! Here is what we did with our extra time in China. Friday was a nice and relaxed day which started out with a visit to a Chinese Medicine hospital. We had a meeting with a doctor who shared with us some interesting facts about the wisdom of Chinese medicine. The doctor spoke to us about the balance between Yin & Yang in our bodies and the connection between them, as well as about some of the roles our body parts have according to the Chinese philosophy. After a really interesting session, a few more doctors came in to give us diagnoses from us by feeling our pulse and by looking at our tongues. Later on in the day, we gave the students a little bit of free time in the market to buy some snacks and other things they may want for Shabbat and the rest of the trip. Shabbat begins very early in China this time of the year, so after lunch we all had time to relax a bit and shower and get dressed for Shabbat. Our hotel was located a few minutes walk from the Chabad House so we all strolled over for Shabbat services and dinner. And, in case you’ve never been to Chabad, there is a clear understanding that all are welcome as they are with no judgments – so the fact that no one had packed Shabbat clothes was not at all a problem (and the Chabad rabbi knew our flight had been cancelled.) Dinner was great and we really enjoyed being in the synagogue, which is set up as a museum with beautiful stained glass windows depicting Chinese synagogues, most no longer in use, from around the country. It was also really fun to see everyone engaging with the local community and other guests over dinner. Waking up I think we all felt thankful to still be in China, in a great hotel, with great people on the trip! Shabbat morning, we took advantage of Shabbat to rest and had a late wake up (and some students didn’t get moving until lunch!) There was a class which we were invited to attend at the synagogue and services as well of course. By lunch, we were all present at Chabad for another great meal. We enjoyed hearing a dvar torah from the local Rabbi and reflected on how amazing it was to be on the other side of the world and yet connected with the people around us. We also had a chance to hear some stories from the rabbi about life as a Jew in China. He explained to us that he had to wait 3 years in order to set up a local synagogue (Judaism is not one of the five recognized religions in China.) We especially loved hearing about how the rabbi the official rabbi of the Beijing Olympics in 2008. After lunch, we met a local Tai Chi instructor who taught us some basic maneuvers and a few routines. This Thi Chi class was the closest I have ever felt to being a celebrity! As we were practicing the instructor’s movements, we began to realize that we had become a major attraction in the park for a pretty large crowd of Chinese people that came to watch. I have to say, we did a pretty good job! Couple of people from our new fan base also decided to join in and practice Tai Chi with us. It was a great experience! Later in the afternoon, we walked to the 798 Art District which was about a half hour walk away. It was really nice navigating a bit by foot and seeing some of the “regular” parts of the city as well. The art quarter was filled with many local art galleries and art installations. It’s a really cool, young and informal area and the students strolled around the different galleries really appreciating the art. 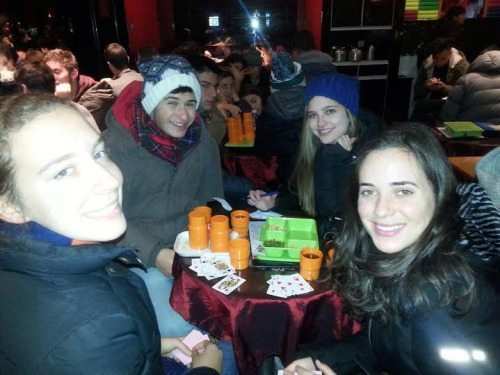 After Shabbat was over, we capped off the day with a visit to a local pub and had a chance to take in the local vibe. On our last day of China (which actually was the last day this time around), we visited the Traditional Museum Of China. It is a huge museum, with thousands of exhibitions about the history of China, ancient coins, the great warriors of all times, some modern Chinese art, and more. The students really appreciated the chance to wander around at their own pace and see the parts of the museum that interested them. From there we continued on, by popular demand, for a second visit to the Silk Market (which is basically a mall) for a second round of shopping. We did a great job supporting the Chinese economy this trip… It will be interesting to see which items bought turn out to be good knock-offs and last for a while. We realized by this point in our visit that although so many things are made here in China, the quality really varies (more than in our home countries) and despite our great bargaining skills, it still may be somehow cheaper to buy in the USA. But all that is part of the experience! In the evening, we surprised the students with a fancy dinner to top off the trip and so that before the flight so they will be happy and sleepy. Then, after 10 hours of flight, we all finally arrived back in Israel. Once we made it back to both Jerusalem and Tel Aviv, the students had time to catch up on their sleep and do some laundry! And the Jet leg, well… not much we can do about that. Lastly, we want to share with you what a pleasure it was taking your children to China. They really appreciated the experiences they had to explore this totally different place than what we are all used to. They were a really good group and they know how to create fun. It was also a great opportunity for us to get to know the students from both cities. Hopefully, we will be some day in China again!